MEETING ROOM - where we gather — Insomnia Coffee Co.
At Insomnia Coffee Company, we recognize that coffee is so much more than a beverage. It’s a starting place for connection, communication and community. We’ve always striven to make comfortable places in which the diversity of Portland’s Westside can be productive, enjoy relationships and relax. Our Dapper & Wise Coffee Lab in the Downtown Hillsboro Insomnia Coffee location provides an approachable, professional canvas for business, non-profit and community meetings, alike. 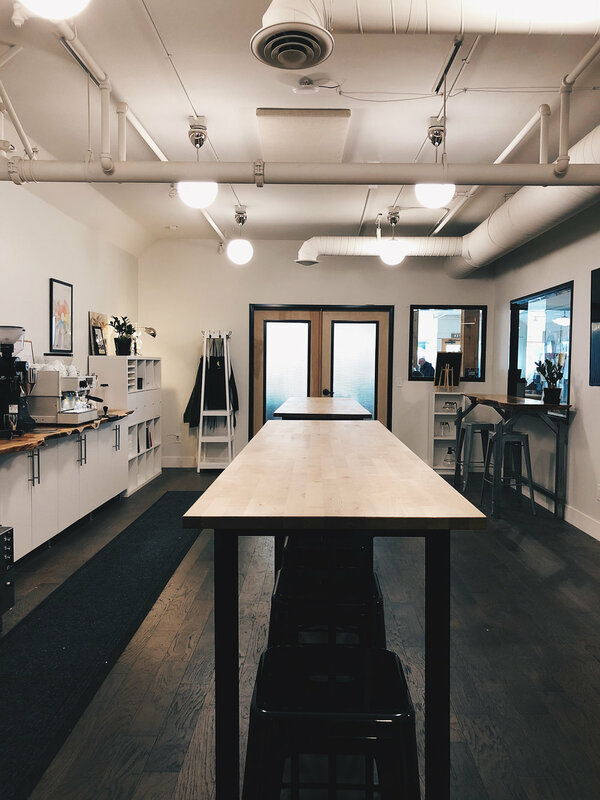 Just inside the main lobby of the 3rd & Main Insomnia Coffee location, the Coffee Lab is equipped with all the amenities one needs for a stellar gathering AND it offers unparalleled access to the most important meeting room feature possible: COFFEE. Executive features including a 70” HD television, accessibility connections and private Wifi. Complimentary pump pot of hot brewed coffee and ice water with every booking. Chic, modern style with vintage accents, live edge PNW wood elements and schoolhouse charm. Stool seating for 15, standing room for up to 25. Versatile tall tables for conference type setup or separate break-out group options. Dimmable lighting to enhance presentations, energize conversation or foster a creative mood. Windows to allow for a spacious feel, while private enough for confidential meetings. Because the Coffee Lab is in use on a regular basis, the availability is in specific windows of time but we do our best to accommodate scheduling with a smile. The most common use for the space is a meeting of 15 or so folks for two or three hours. All day conferences may not be a good fit due to the limited availability and seating. General availability includes: Mondays, Tuesdays, Wednesday afternoons, Thursdays, Saturday afternoons and Sundays unless otherwise reserved. We’d love to walk you through the process to see if our meeting space is a good match for your event! Please tell us what date you'd like to book the Meeting Room! For how many hours would you like to reserve the space? Thank you for your request! We'll be in touch with you soon about your event!